Yesterday I ran a PCR amplification using DNAs from single colonies of 7 different A. pleuropneumonia isolates, and got absolutely no DNA fragments from any of them. This amplification worked fine last time. Can I figure out what went wrong? I checked the run record of the PCR machine - it looks fine. I checked the freezer box with the tubes of dNTP stock, 5X buffer, and Q5 polymerase, to be sure I hadn't picked up a wrong tube. I checked my notes, to be sure I hadn't left out any component of the reaction mix. I'd checked off each reagent as I added it, and the final volume was as expected. I checked the 'F' and 'R' primer tubes (in another freezer box) to make sure I'd used the correct ones. I'd made up more of the 10 mM dilution stock, so I also checked that I'd used the right tubes of the more-concentrated 100 mM stock to do this. I even checked the remaining volumes in the two primer tubes - if I'd added one primer twice and not the other these volumes should differ by about 17 µl, but they're within a few µl. I prepped the colony DNAs slightly differently. Last time (prep 1) I put a whole colony into 100 µl of medium, then diluted 5 µl of that into 45 µl water and heated to 98 °C for 10 min to lyse the cells and free their DNA. This time (prep 2) I put part of a colony into 100 µl water, heated that, and then pelleted out any cell debris. Both times 1 used 1 µl of the heated sample. What could I try now? When I last posted, nearly 3 weeks ago, my first attempt to generate the desired full-length knockout construct had given a mixture of fragments rather than just the desired full-length one. But this mixture did include a relatively faint fragment of the desired size (3.6 kb). I did try to get a better PCR product, but increasing the annealing temperature made things worse, and I couldn't find a PCR app that would let me diagnose which incorrect-priming reactions were producing the unwanted fragments. So I went ahead and transformed competent Actinobacillus pleuropneumoniae cells with the mixture, selecting for spectinomycin resistance. 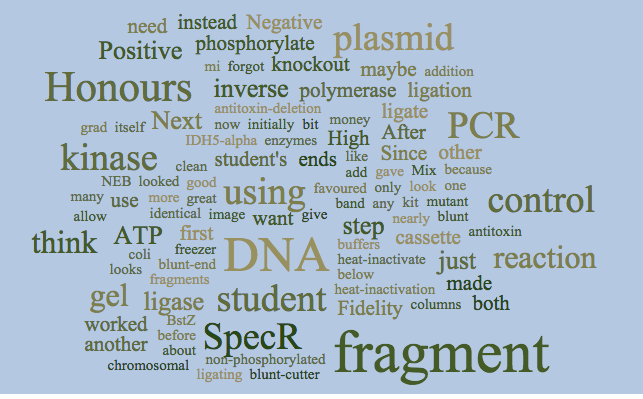 My logic was that only the desired fragment is likely to efficiently transform cells to SpecR, because other fragments were unlikely to have the correct homologous DNAs flanking the SpecR cassette. If the 3.6 kb fragment was what I hoped it was, I should get thousands of transformants even though it was only about 10% of the total DNA in the mixture. If it wasn't what I wanted, then it would probably transform very inefficiently if at all and I would get very few transformants. I got thousands of transformants in my first try. Since the real goal of this project is to find out whether knocking out the antitoxin gene prevents transformation in A. pleuropneumoniae as it does in H. influenzae, I did a quick-and-dirty competence assay, using 7 pooled SpecR colonies and some kanamycin-resistant A. pleuropneumoniae chromosomal DNA. This gave lots of KanR transformants, but luckily I didn't take this as a final result. 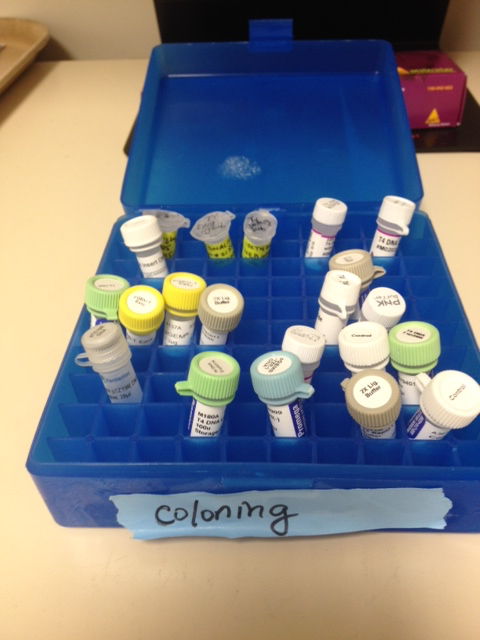 I tested 2 of these colonies by PCR. Only one (14-1) gave the expected 3.6 kb full-length product and 1.1 kb Spec cassette products. The other (14-2) gave no product with the full-length primers and what looked to be a slightly small product with the Spec primers. The control wildtype cells gave the expected 2.6 kb full-length fragment and no Spec fragment. At the same time I tested both colonies for the ability to be transformed. Both were defective, with transformation frequencies 100-fold lower than the wildtype cells. This is the most interesting result - it suggests that the Toxin-antitoxin system in A. pleuropneumoniae plays the same role in competence as its homologue does in H. influenzae. 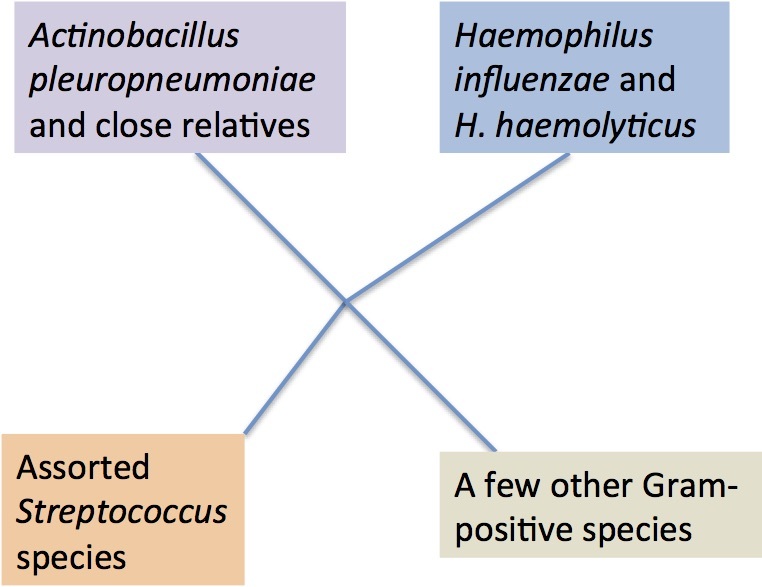 Next steps: More comprehensive characterization of all the A. pleuropneumoniae mutants. 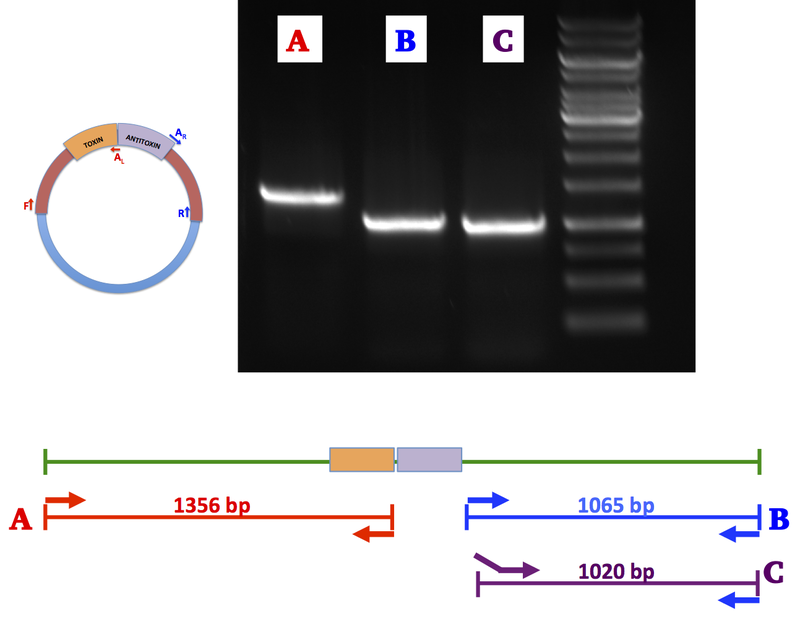 First do the full-length PCR on colonies 14-1, -2, -3 and -4, on the ∆toxin and ∆toxin/antitoxin mutants made by the honours student, and on the wildtype control, this time running the gel more slowly to better characterize the fragment lengths. Then do additional PCRs using other primers, to confirm the mutant structures, and repeat the competence assays on all these strains. I'll also need to get all the final mutants sequenced, to confirm that they have only the expected deletions. I'll email the former RA to ask her the best way to do this (do I send genomic DNA or PCR products, what primers are best...). In the left lane (high template) I see a faint full-length band, and a stronger band the expected size of one of the expected intermediates. In the right lane (low template) I see only the intermediate band. This is a fine result. I'm now using 0.5 µl of the high-template reaction as the template in a new reaction with the same F and R primers and an annealing temperature optimized for them. I hope this will give me lots of the full-length product. Streak out the honours undergrad's A. pleuropneumoniae SpcR mutants (she made three different ones with the same cassette I'm using). Check the sensitivity of A. pleuropneumoniae to spectinomycin, since this is the selection I will be using for transformation by my fragment. The honours undergrad did this but her notes are not very good here. I need to identify a concentration that will prevent colony formation by the sensitive cells but allow it by the resistant cells. Make a competent stock of the recipient (SpcS) by growing the cells in MIV starvation medium. Check the competence of these cells by transforming them with genetically marked DNA. I know I have some old DNA for this purpose (NalR? ), but it would be good to select for SpcR using DNA from one of the undergrad's SpcR strains, if I can find this. Before doing the final transformation I should also digest my transforming fragment with a couple of diagnostic restriction enzymes, just to be sure it is what I want. Progress! The big fragment-assembling PCR is running! The PCR amplification of the SpcR fragment worked fine yesterday (after I spent an hour staring at (forward and reverse and complement and reverse-complement) primer sequences to reassure myself that I'd ordered the correct ones). And today I did a column cleanup and a gel purification. And now I'm running the PCR reaction that I hope will assemble the complete DNA fragment. The part I'm doing now is shown below. You can see the whole plan in this post. Most of the green strands will just reanneal to their complements. Probably many of the red and blue strands do too. This is an unwanted process that reduces the availability of strands for the desired annealings and elongations. In normal PCR this is hindered by the very high concentrations of the primers, but here we only have the F and R primers. Primer F anneals to the lower red strand and primes synthesis of the upper red strand. At the same time, primer R anneals to the upper blue strand and primes synthesis of the lower blue strand. Both of these new strands accumulate linearly, not exponentially. This provides more of the appropriate strands red and blue for STEP 4. 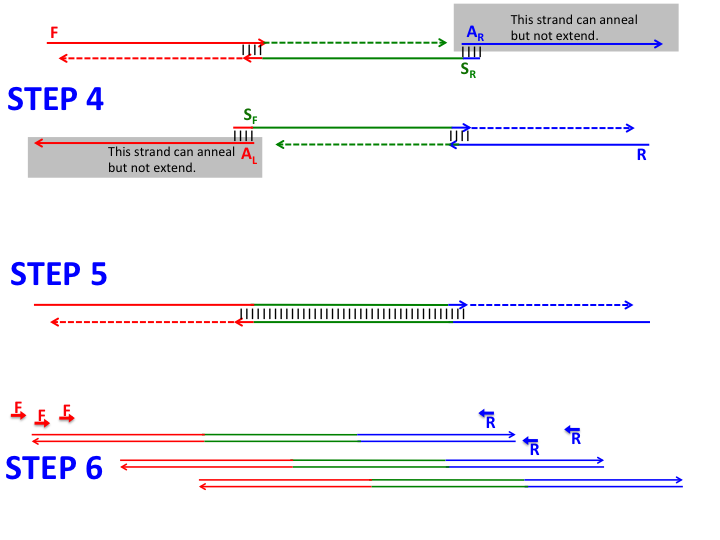 STEP 4 above: Sometimes the upper red strand anneals to the lower green strand (by their 17 bp of complementarity), and elongation in both directions produces hybrid upper and lower (red + green) strands. Similarly, sometimes the upper green strand anneals to the lower blue strand (by their 16 bp of complementarity), and elongation in both directions produces hybrid upper and lower (green +_ blue) strands. All these strands also accumulate linearly, not exponentially. They provide the effective strands for STEP 5. STEP 5 above: Sometimes the hybrid strands from STEP 4 anneal to each other instead of to their complements (by their 1260 bp of complementarity). Elongation in both directions produces the full-length strands. STEP 6 above: Now primers F and R can anneal to the full-length strands, leading to exponential amplification of this desired product. I don't know how much template is appropriate, so I'm trying two concentrations, one 100-fold lower than the other. The rate-limiting step is STEP 4, the annealing of the red and green strands by their 17 bp overlap, and of the green and blue strands by their 16 bp overlap. I'm using a fairly low annealing temperature to facilitate this. If I don't get any product I'll try lowering it further. If I hadn't mixed the red and blue fragments for purification I might have set up partial reactions (red + green and blue + green), to make it easier to monitor progress. If the all-in-one reaction doesn't work I'll probably make some more of each fragment and purify them separately so I can troubleshoot in separate reactions. First I pooled what was left of the two PCR reactions (A and B). The volume of each was about equal to the amount I had run in my gel yesterday (left panel below). Then I did a column cleanup to get rid fo the bulk of the PPCR primers, using an old EconoSpin column that I'd revived by passing 0.2 N NaOH through it. Then I ran all of the eluate from that column in one lane of a 1.2% agarose gel. I used only about 1/5 of the usual concentration of Ethidium Bromide, and I viewed the gel only with our hand-held long-wave UV lamp to avoid UV damage to the DNA. The bands were faint but clear and I cut them out together in one gel slice. 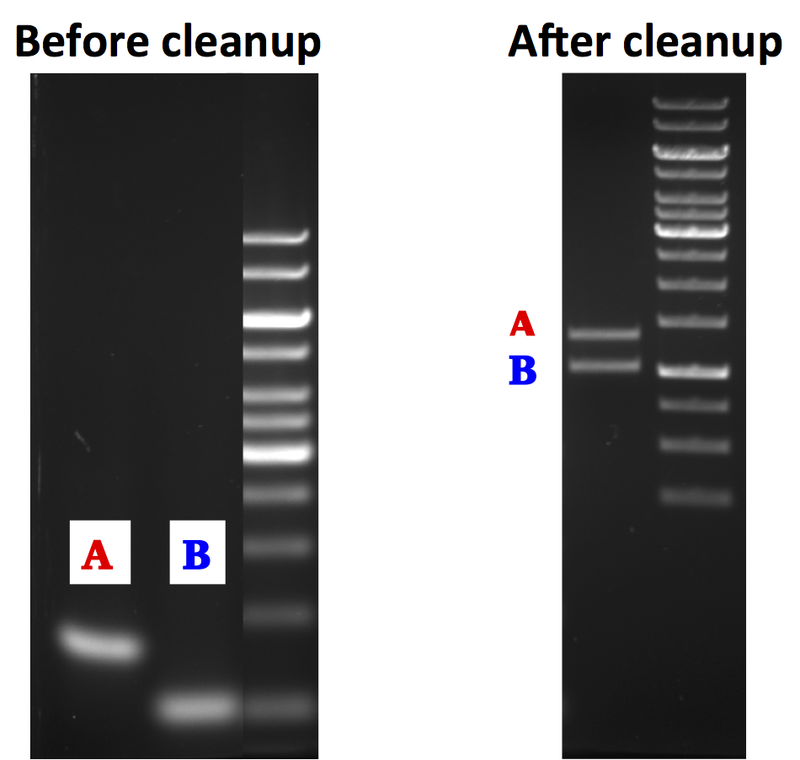 Then I used our new Zymoclean gel-recovery kit to dissolve the agarose and recover the DNA, and ran 3 µl of the resulting 24 µl in unused lanes of the same gel I used yesterday, to see how much DNA I had recovered. The results look great. The bands are sharp and bright and the right sizes, and the intensities suggest that I've recovered most and perhaps all of the DNA I began with. So now this prep is in the fridge, waiting for the other piece of the construct. The Methods section of a manuscript I was reviewing reminded me that it's possible to use PCR to create a gene knockout, and then transform the PCR product directly into naturally competent cells, without an intermediate cloning step. We actually had tried out this method bout 20 years ago, when the H. influenzae genome sequence first became available, but after some experiments we decided that cloning was usually more reliable. But now I'm in a situation where cloning is being very unreliable indeed, enough so that I can't bring myself to try again. So instead I'm going to try the direct-transformation method. 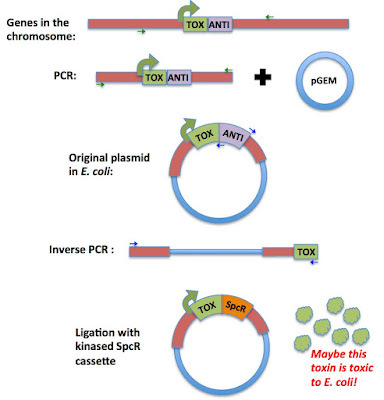 In two independent PCR reactions, amplify the left and right genome segments flanking the gene to be deleted (the antitoxin gene). These segments need to be long enough to later allow efficient homologous recombination of the final construct into the chromosome. Separately amplify a Spectinomycin-resistance cassette (SpcR), using primers designed with tails complementary to the inner ends of the two genome fragments. 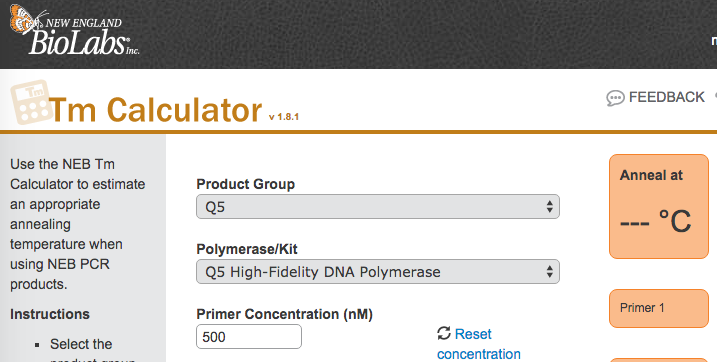 Remove all primers from these PCR products and mix them together in a PCR reaction mix with no added primers. Do one cycle of strand melting, strand annealing (of the primer tails), and strand extension by Taq. This produces two mid-length fragments that both contain the SpcR segment. Do another cycle of strand melting, strand annealing (this time of the full SpcR segment), and strand extension by Taq. 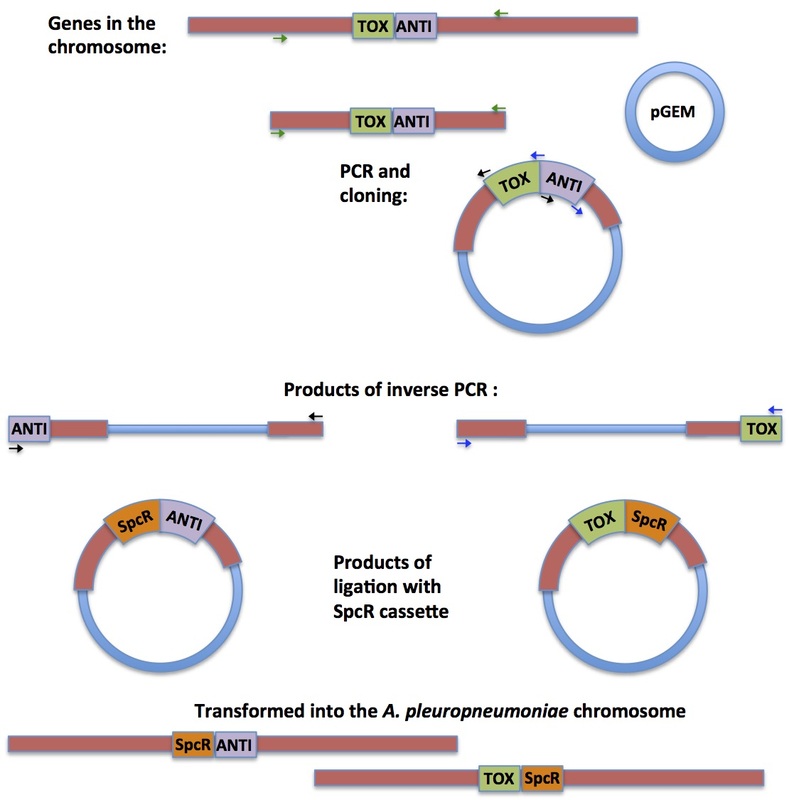 This produces one full-length fragment containing both genome segments and the SpcR segment. Add the outermost genome primers (left primer of the left segment and right primer of the right segment) and carry out a normal PCR amplification. 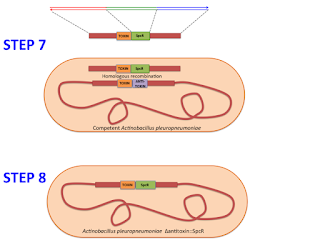 Transform the resulting fragment into competent A. pleuropneumoniae cells. Select for SpcR and confirm the new genotype by PCR. Now I need to dig into the sequence file and primer files to figure out whether I can reuse primers we already have, and to design the new SF and SR primers with the appropriate tails. Gisela Storz from NIH gave a great seminar here yesterday about the many roles that small RNAs and very small proteins play in E. coli gene regulation. It gave me an idea about the role the small-RNA-accessory protein Hfq might be playing in competence regulation. One example she discussed is the abundant Spot 42 RNA, so named because it was discovered as an RNA chromatography spot long before any function was discovered. 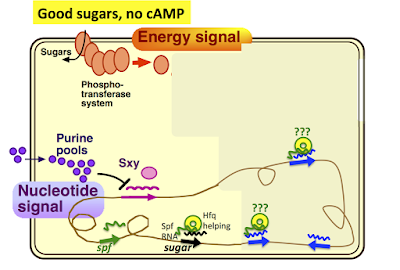 This small (109 nt) RNA acts in a feed-forward regulatory loop with the cAMP-dependent transcriptional activator CRP. 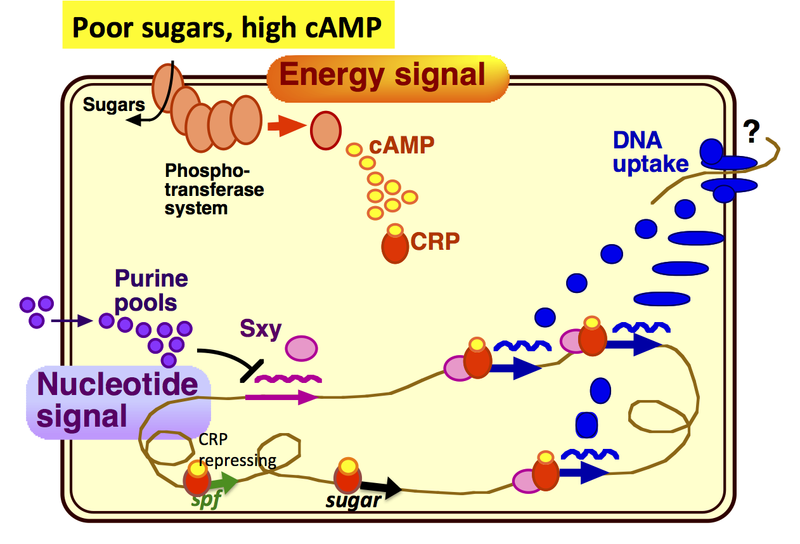 This regulation fine-tunes the control of the CRP-activated genes that provide the cell with alternative carbon sources when its preferred sugars are depleted. 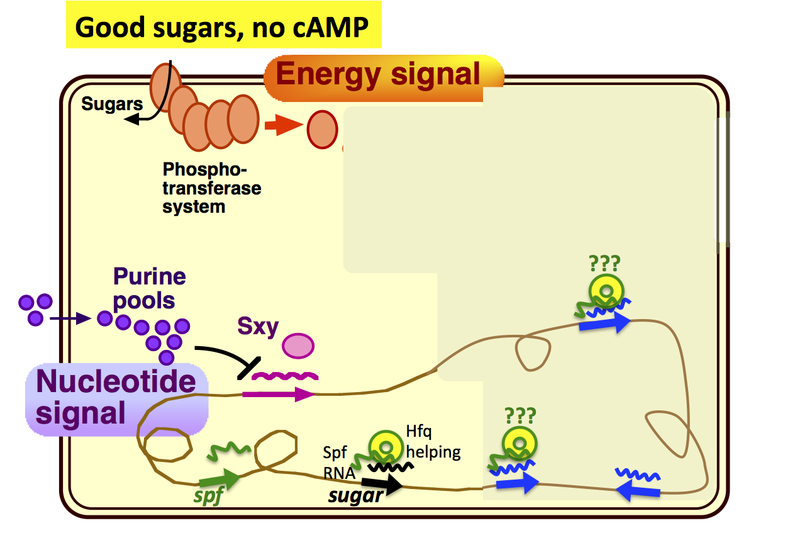 When the preferred sugars are available, Spot 42 RNA is expressed and limits the translation of genes for using the alternative carbon sources. 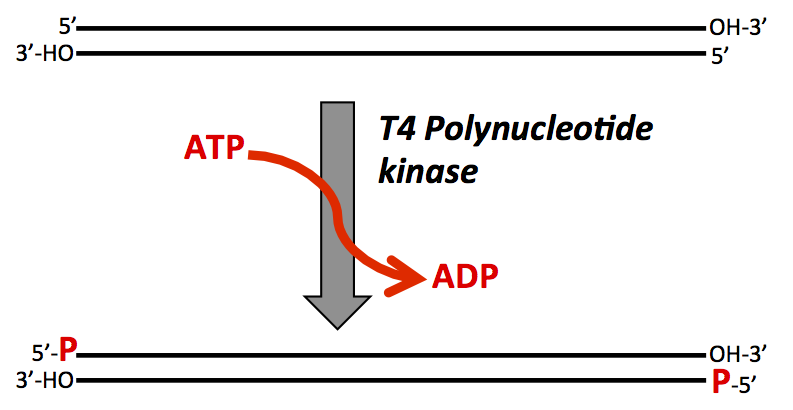 Expression of these genes is already low because there is no active CRP to stimulate their transcription, and Spot 42 RNA prevents translation of any transcripts that might inadvertently get made. The contribution of Hfq (the yellow donut) is to help Spot 42 RNA interact with its target mRNAs and prevent their translation. 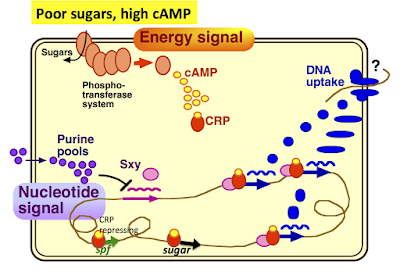 But when the preferred sugars run out, active CRP represses transcription of the spf gene, so Spot 42 RNA isn't made. (Yes, I know I said that CRP is a transcriptional activator, but it can also be a repressor when its binding site is on top of or downstream of the promoter.) 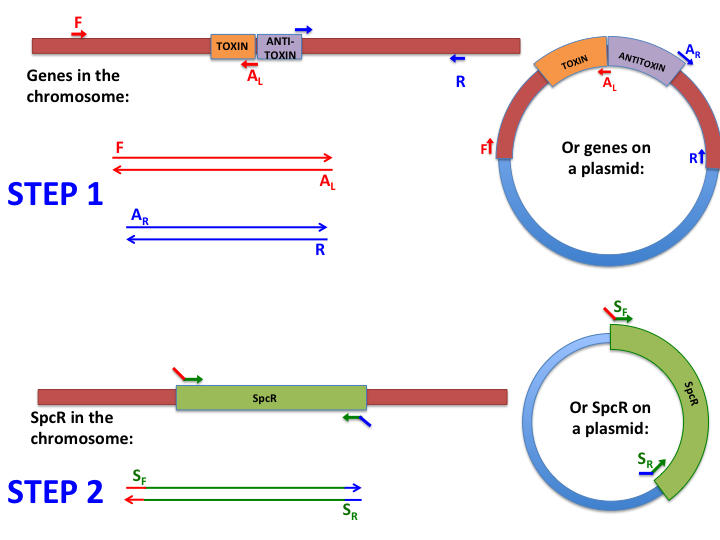 Now the transcription that CRP stimulates produces mRNAs that are efficiently translated. So in E. coli Spot 42 RNA improves the stringency of the regulation that we have been giving CRP full credit for. Where does H. influenzae competence come in? Our Hfq knockout lowers competence, and the other honours student showed that this is because it makes competence more dependent on high cAMP than it usually is. So I got excited by the idea that maybe Hfq's role in competence had to do with its role in mediating Spot 42 activity on CRP-dependent transcripts. This could either be activity on CRP-dependent transcripts of the competence-specific transcriptional activator Sxy, or on the various CRP-dependent transcripts of the DNA uptake machinery. But this falls apart in two independent ways. First, my logic is backwards. Now that I've created these diagrams it's obvious that Hfq's contribution to competence regulation acts in the opposite direction. Knocking out hfq would be expected to increase the expression of competence genes under non-inducing conditions, not decrease it under inducing conditions. Second, it looks like H. influenzae doesn't even have a Spot 42 homolog. Homologs are ubiquitous in the Enterobacteraceae, and have recently been shown to also be common in the Vibrionaceae, with about 85% sequence identity. But BLAST searches of the Pasteurellaceae with either type of sequence didn't find a single homolog. Given the relationships shown in the tree below. I think the ancestral Pasteurellacean must have lost its Spot 42 homolog. 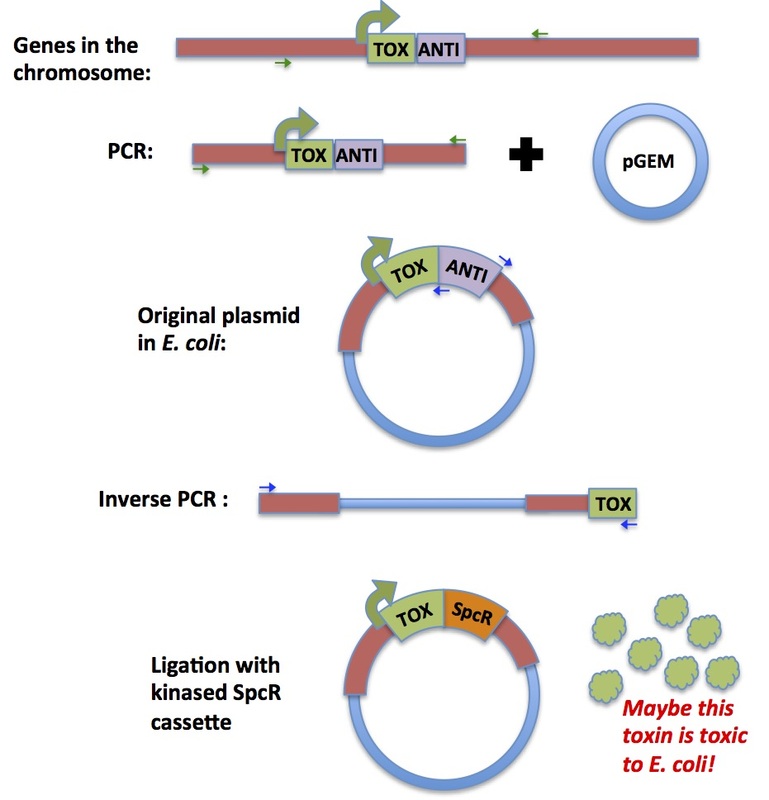 At the end of my last post I was about to test the toxicity to E. coli of the 'toxin' gene adjacent to the gene I'm trying to knock out. I did this by instead trying to create the same plasmid the undergrad had created, one that (unintendedly) deletes the end of the toxin orf as well as the adjacent gene. So I repeated the inverse-PCR reaction using her old primers instead of my new ones, and used this fragment in my kinase-ligate-transform experiment. I tested both the ability of this fragment to self-ligate after being treated with kinase, and its ability to ligate to a SpecR PCR fragment that had been treated with kinase. The former produced only four AmpR colonies, and the latter no AmpR SpecR colonies. I didn't do plasmid preps on the AmpR colonies to see if they contained the expected plasmid, though maybe I should have. Although failure of this experiment does not disprove the hypothesis that the toxin gene is toxic to E. coli, it does disprove the hypothesis that the hypothesized toxicity is the reason that my previous experiments failed. Sorry, that's a nasty sentence - try again: Since this experiment worked for the undergrad last spring but not for me now, toxin-toxicity is unlikely to be why my experiments are failing. Next I made a list of the various approaches I could try - I'll get back to these below. 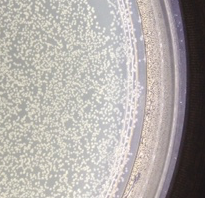 As a positive control, the same amount of uncut plasmid gave about 3000 colonies. So I concluded that my blunt-end ligation reaction conditions were fine. Can I then conclude that the problem is the kinase reactions? Unfortunately this wasn't a very stringent test of the ability of the SpecR fragment to be blunt-end-ligated into a vector, because I didn't pay attention to the relative proportions of the vector and insert. 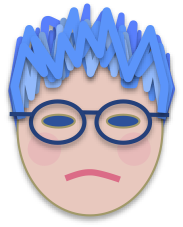 I should have used a limiting amount of the vector and lots of insert, but I actually used about equal amounts. Since self-ligation of the vector is a unimolecular reaction it is expected to be much more efficient than insertion of the Spec fragment. This experiment used up the last of my control SpecR AmpR plasmid stock so I grew up the cells and did a miniprep. But this didn't give any plasmid at all either, just some chromosomal DNA! Can something also be wrong with the plasmid prep solutions, or my procedure? The grad student is trying to use the same kinase to label his DNA with 32P-ATP. He's not having much success either so he's going to test my fragments, which are much simpler substrates than the sheared chromosomal DNA he's been using. Maybe the toxin is toxic! After the first attempt failed I introduced several controls: EcoRI-cut pUC18 as a ligation control, another SpecR AmpR plasmid as a transformation control, and the kinase-treated inverse-PCR fragment as a kinase control. The ligation and transformation controls worked, so I decided the kinase was at fault. This hypothesis was supported by finding that I had been using a long-expired stock of kinase rather than the one bought earlier this year. I've been trying to think of what else could be going wrong with the kinase reaction, but it just occurred to me that maybe there's a completely different problem - maybe this toxin is toxic to E. coli. Although the honours student had mentioned this concern when she handed this project over to me, I had discounted it because the H. influenzae homolog is not toxic in either H. influenzae or E. coli. But both my desired construct and the recircularized inverse-PCR fragment I'm using as a control are expected to express the toxin, possibly at high levels. So maybe my reactions are all working, but the plasmid they produce is not tolerated by E. coli. How to test this? Directly testing for lethality is tricky. But I can do a different kinase control using a different inverse-PCR fragment, one that won't express the toxin. If the problem is the toxin, this should give AmpR transformants. I can also use the same fragment with the spec cassette, and I should now get SpecR AmpR transformants. I have all the honours student's primers and her CR conditions so this should be straightforward. 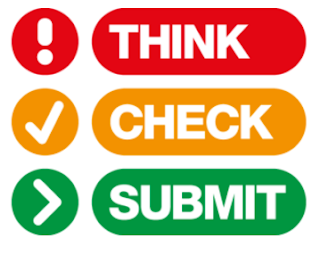 Think Check Submit - can't we do better than this? The Scholarly Kitchen blog has a post about a new initiative from a large consortium of scholarly publishing societies and individual publishers, intended to help inexperienced researchers avoid journals from 'predatory publishers'. This is a very worthwhile goal, but the actual advice provided so far isn't going to exclude most of the bad guys. There's nothing wrong with this advice, but it's certainly not treading on any publishers' toes. Most importantly, there's no mention of the most valuable resource we have, Beale's List. This is a frighteningly long list of open-access scholarly publishers whose tactics are potentially, possibly or probably predatory. It's maintained by Jeffrey Beale, a librarian at the University of Colorado, at his Scholarly Open Access blog. The last time I checked, a couple of years ago, there were about 300 publishers on this list, but today there are 882! 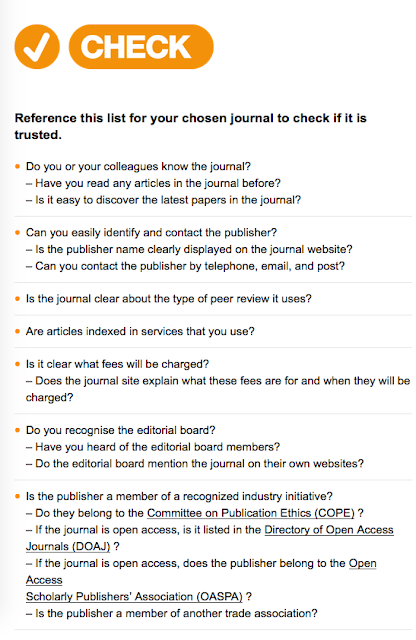 And this is just the publishers - most of these have multiple journals. Beale's list isn't just a list. 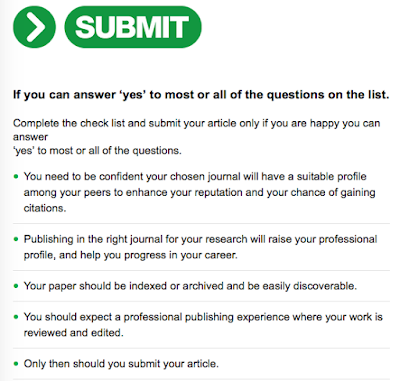 Beale also provides explicit sets of criteria for evaluating individual publishers and journals. 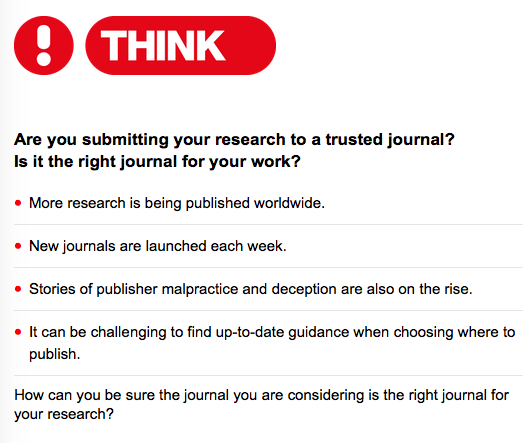 The absence of Beale's List from the THINK CHECK SUBMIT campaign isn't really surprising, but it reinforces my concern that we can't rely on the publishers to look out for researchers' interests. Along with new stocks of other enzymes. Somebody apparently thought it was a good idea to stop putting enzyme stocks in their usual place (the 'Special Enzymes' box) in the -20 °C freezer, and instead put them in this new 'coloning' box. They then put the new box in a bin in the freezer where its label couldn't be seen. Yesterday's experiment worked very well, in that the thorough controls clearly tell me where the problem is. But the actual experiment produced only three candidate colonies. Control F: AmpR SpecR Plasmid. 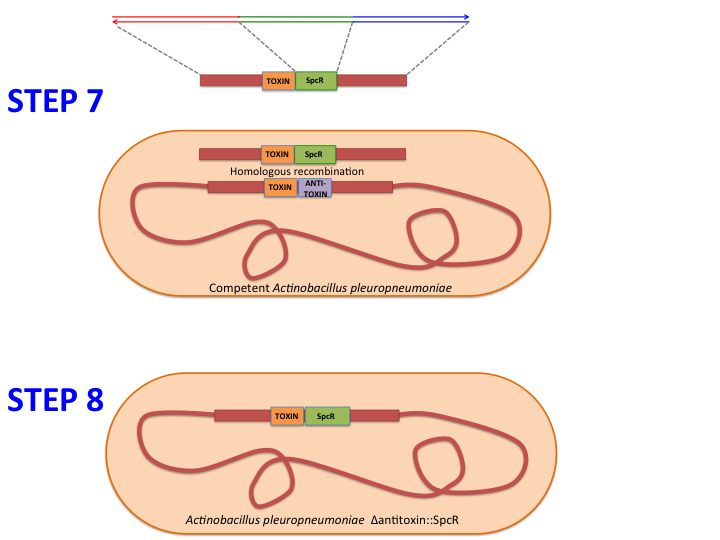 p∆TA::Spec: ~350 AmpR and ~350 SpecR transformants GOOD-selective plates select for cells carrying the resistance genes on a plasmid, and the competent cells transformed efficiently. Controls D and G: EcoRI-cut pUC18 ± ligase. ~12,500 AmpR colonies after ligation, only about 250 without ligase. GOOD- ligation worked. Control C: No-ligation control. 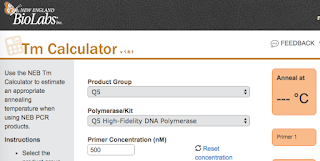 Kinased spec PCR product plus not-kinased inverse-PCR product, ligation reaction with no ligase. 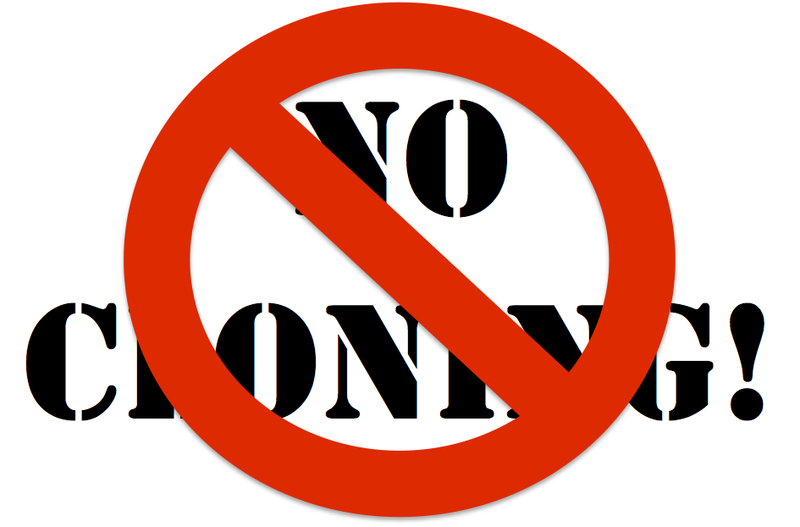 No SpecR or AmpR colonies. GOOD-The fragments do not spontaneously circularize and transform cells, and the fragment mixtures do not contain any unwanted intact plasmid. Control B: Kinase control. Ligation of kinased inverse-PCR fragment. Should have given AmpR colonies, but none. BAD- Kinase failure. 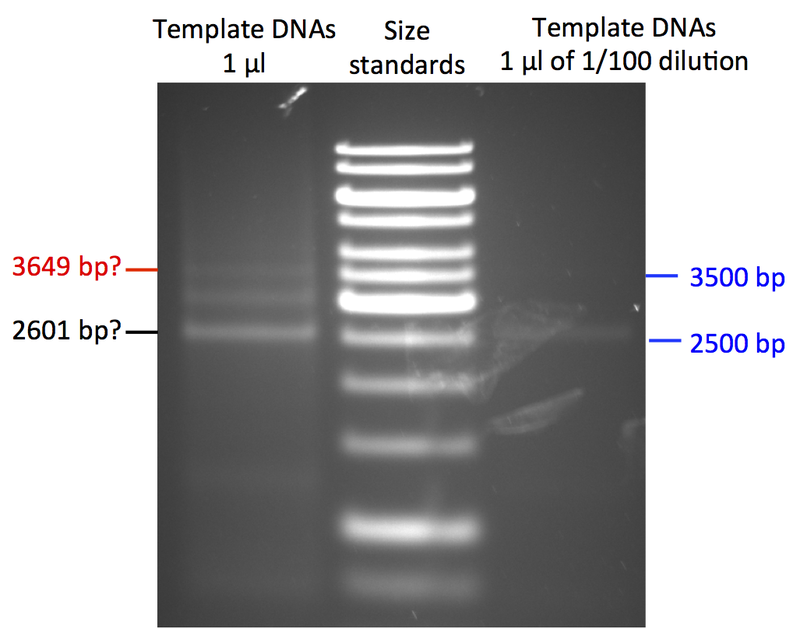 Experiment: Ligation of kinased spec PCR product plus not-kinased inverse-PCR product. Gave only 1 AmpR colony and two SpecR colonies. I've streaked the three candidate colonies on both Spec and Amp plates. 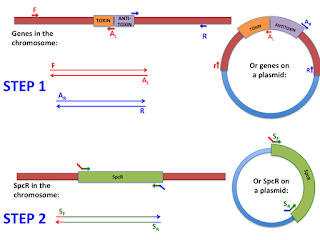 The desired plasmid should confer resistance to both. And I looked at the expiration date on the tube of BioLabs T4 polynucleotide kinase I've been using. 03/09!!!! AAARRRGGGHH!!!! Have I been using the wrong tube of kinase? Is this not the kinase that the former undergrad and sabbatical visitor used successfully last year? Searching the 'Special Enzymes' freezer box turned up another tube of T4 polynucleotide kinase, but this one looks even older. So I've just emailed the undergrad and sabbatical visitor to ask what they used. I did the test experiment described in the previous post, and then spent the past few days figuring out why my positive control transformation didn't work any more. The test experiment was to kinase, ligate and transform into DH5alpha the product of the inverse-PCR reaction. 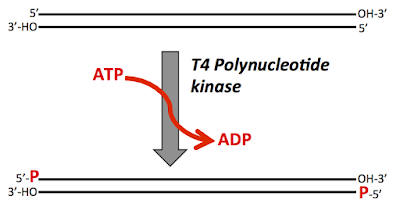 If the T4 polynucleotide kinase reaction worked, its blunt ends would acquire 5' phosphates that would allow it to be circularized by T4 DNA ligase, and to then transform DH5alpha to ampicillin resistance. 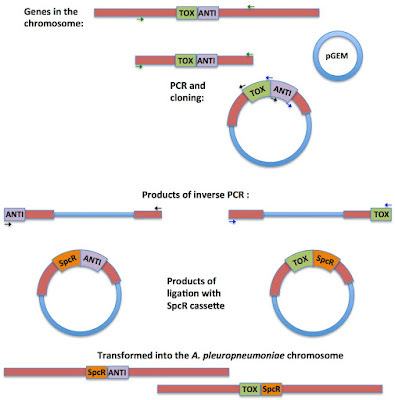 The negative control was no DNA and the positive control was the same p∆TA:spec plasmid that had given thousands of AmpR and SpecR transformants in the previous experiment. Sounds great, but this time the positive control didn't give any transformants at all! Background small colonies were frequent, possibly because the plates were a bit old and the ampicillin had lost its potency, so I didn't trust the few larger colonies on the inverse-PCR reactions plates. I streaked a few of the large colonies to check if they were genuinely AmpR - one was. I repeated the control transformation and negative control with new Amp plates; the no-DNA control plates were clean but so were the p∆TA:spec plates. I thought the problem might be the plasmid, but I wasn't sure I have another reliable positive control. So I did a miniprep from the one genuine AmpR colony I had streaked and transformed the cells with that DNA. I also had the usual no-DNA control, the undergrad's p∆TA:spec, another plasmid made by the undergrad (used successfully by me as the inverse-PCR template, and some pUC18 left by a sabbatical visitor. Success all around. 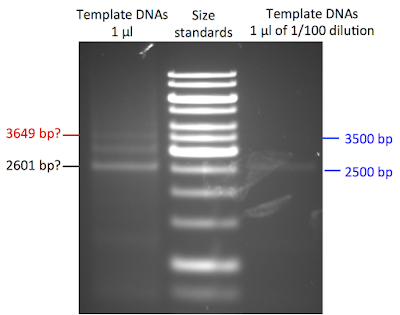 The miniprep DNA, the other undergrad plasmid and the pUC18 all gave lots of transformants (the photo shows part of a pUC18 plate), and the undergrad's p∆TA:spec and the no-DNA control gave none. I don't know why the p∆TA:spec plasmid worked well in my first experiment - maybe I had grabbed a 'wrong' (i.e. good DNA)tube. Next step, repeating my original experiment (the one in the previous post), this time with better controls. 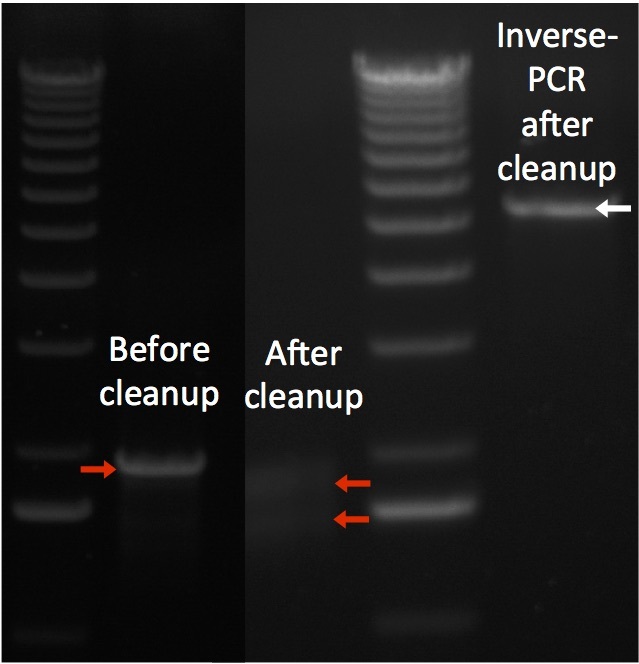 DNA clean-up: I did a new inverse-PCR reaction because the old one got used up in the tests. I need to start by doing a spin-column cleanup of it. Two kinase reactions: (i) the 'blurry' spec PCR product and (ii) the not-blurry inverse-PCR product. Heat-inactivate the kinase before step 3 (65°C 20 min). This time I'll use a newer stock of ATP, and the official kinase buffer. Four ligase reactions: A. The kinased spec fragment plus not-kinased inverse-PCR fragment. B. 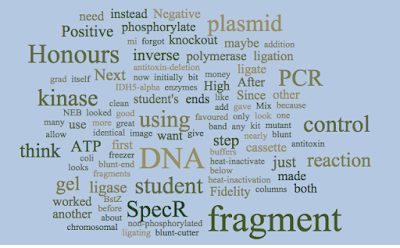 (kinase control) The kinased inverse-PCR fragment. C. (negative control) The not-kinased spec fragment plus the not-kinased inverse-PCR fragment . D. (positive control) pUC18 cut with EcoRI and heat-inactivated (65°C 20 min). Six transformations: Ligations A, B, C and D, plus 1 µl pUC18 as positive control and no DNA as negative control. Preparations: We have enough kinase, and I've just sent the grad student to buy more ligase. Luckily I have lots of frozen competent cells for the transformations. I'll need to digest the pUC18 and check it in a gel, and pour lots of Amp plates and some Spec plates.